Was Critical Note Muzzled By Bush White House? A former State Department lawyer tells NPR he believes the Bush administration sought to collect and destroyed all copies of a 2005 memo he wrote arguing against harsh interrogation techniques. Was Critical Note Muzzled By Bush White House? 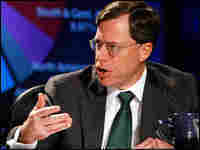 Philip Zelikow is a former State Department lawyer who advised then-Secretary of State Condoleezza Rice. A former State Department lawyer has told NPR he believes the Bush White House sought to collect and destroy all copies of a 2005 memo he wrote arguing against harsh interrogation techniques for terrorism suspects. 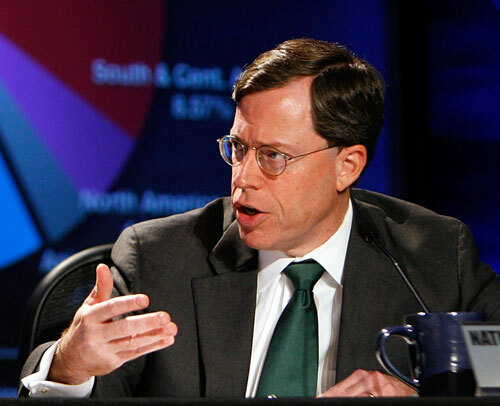 In an NPR interview, Philip Zelikow, a former State Department lawyer and adviser to then-Secretary of State Condoleezza Rice, said he had been told by a colleague that his legal opinion had been ordered to be collected and destroyed. The memo argued against the legality of such techniques as waterboarding, or controlled drowning, and chaining suspects to ceilings for days at a time. "My guess is that they thought I was out of line," Zelikow said, adding that he thought the Bush administration viewed the memo as an "inappropriate and inconvenient piece of paper." Zelikow's comments come a week after the Justice Department released more than 100 pages of legal guidance that was given to the CIA regarding what some people consider torture techniques. On Wednesday, a Senate Committee also released a detailed timeline on the military's use of harsh interrogations. The timeline indicates that Rice was more involved in signing off on the use of the techniques in question than she has previously acknowledged. The new information shows that in July 2002, Rice, who was national security adviser at the time, gave her verbal approval to then-CIA Director George Tenet to allow alleged al-Qaida terrorist Abu Zubaydah to be subjected to waterboarding. It was the Bush administration's first known approval of the interrogation technique. Zelikow, speaking with NPR's Morning Edition, said the memo outlined his legal reasoning that it was unlikely that "any federal court would agree (that the approval of harsh interrogation techniques) ... was a reasonable interpretation of the Constitution." "I felt obliged to argue that this was an extreme view of American constitutional law," Zelikow said. "The CIA disagreed, said 'we know better,' and 'we're the ones running this program and we think it works,' " he said. The CIA later dropped the use of controlled drowning. Zelikow, who said he believed some others in the administration agreed with his point of view, nonetheless acknowledged that the methods of interrogation employed by the CIA "produced a lot of valuable information." "The question is whether you could have produced information of equal value in an interrogation process that didn't use these extreme techniques," he said. He said there has been too much focus on waterboarding with little or no mention of other techniques, such as "hanging people from ceilings with chains, naked, so they couldn't fall asleep for days at a time, manipulating their diet, cramming them into boxes in stress positions, slapping them around — all these other things are employed in combination as part of a program." Zelikow credits Rice with bringing up his concerns to President Bush when she served as secretary of state. "I must say that I think one of the reasons that Secretary Rice was able to voice these concerns is because President Bush wanted to hear them," he said. Explaining the discussion within the administration, Zelikow said there was "a heated argument going on, with the president's knowledge, on the inside. There's also an argument on the outside with the Congress, and then there's the activity in the courts. All those things came together to create a turning point, a dramatic change in the program in 2006." The five-month gap between Zubaydah's capture in Faisalabad, Pakistan, in March 2002 and Rice granting permission for harsh techniques to be used in his case has raised questions for legal scholars such as Karen Greenberg of New York University's Center on Law and Security. "What were they doing to him in that intervening period of time? We don't know," Greenberg said. Zubaydah's description of his treatment is classified, but his lawyers have made it clear that they believe he was tortured before the Justice Department had authorized such treatment. "Are there verbal conversations in which lawyers from the Justice Department are saying 'yes, no, these measures are or are not OK'?" asked Aziz Huq of the University of Chicago Law School. "Those communications may never have been reduced to writing, at least until August 2002, but do they exist?" In August 2002, the Justice Department identified the line between harsh interrogations and torture, but at least one memo indicates that CIA interrogators waterboarded more than their guidance permitted. Greenberg also refers to a detainee by the name of Walid bin Attash who was interviewed by the International Committee of the Red Cross. Bin Attash told the ICRC that he had been "shackled with his hands above his head for a two-week-long period," she said. "The memos are specific about shackling," she said, with CIA guidance allowing the technique for "only two hours." There already is a congressional probe into the actions of CIA interrogators. Senate Intelligence Committee Chairwoman Dianne Feinstein says staff investigators are closely examining the interrogations of more than two dozen high-value detainees. "At the end of it, we should have a very good chronology of exactly what happened, how it happened and whether it was within the law, whether it was not within the law, what the orders were," she says. "All of that — and it's very important that it be done in a classified arena." Any prosecutions that might arise from congressional investigations into the Bush-era tactics would likely end up in the courts. But Congress does have the power to sanction Jay Bybee, who signed two of the memos about the harsh interrogation techniques, because Bybee has a lifetime appointment as a judge on the Ninth Circuit Court of Appeals. He was confirmed for that post six years ago by the U.S. Senate without disclosing that he had signed the memos while heading the Justice Department's Office of Legal Counsel. There are growing calls by congressional Democrats to impeach Bybee and remove him from the federal bench. In Bybee's defense, his Republican allies point out that because the memos were classified, he could not have disclosed them to Congress.